Prievidza (Slovak pronunciation: [ˈpɾɪ̯ɛʋidza] ( listen); Hungarian: Privigye, German: Priwitz) is a city in the central-western Slovakia. With 46,553 inhabitants  it is the second biggest municipality in the Trenčín Region and 11th largest city in Slovakia generally. The name is probably deduced from a personal name Previd with possessive sufix -ja (Previd's village). An alternative and less probable is a derivation from vid- (Slovak: vidieť - to see, "previdieť" - to see through), thus "the village which can be seen from all directions", "the village in the thin stand". As a central city of Prievidza District and Upper Nitra Basin (Horná Nitra in Slovak) Prievidza is a seat for many institutions of regional importance - governmental as well as commercial. Because of relatively high percentage of planted trees, Prievidza is commonly called as the "green city". Prievidza has 6 boroughs: Staré mesto (Old Town in English), Píly, Necpaly, Kopanice, Zápotôčky and Žabník and there are three adjoining villages that are an administrative part of Prievidza: Hradec, Malá Lehôtka and Veľká Lehôtka. The Upper Nitra Basin was inhabited as early as the middle of the Paleolithic period, as evidenced by the rich paleontological findings in Bojnice and Prievidza. Thousands of artifacts have been discovered, including stone tools, animal bone fossils and fireplace remnants. The first written mention of Prievidza was in 1113, as ‘‘Preuigan’’. It was promoted to a royal free town in 1383, on the 26th of January. This meant that the town obtained privileges such as paying benefits to hold markets, choice of pastor and mayor, building mills, catching fish, the free development of crafts and sale of produce. From the 16th to the first third of the 17th century, the Thurzó family controlled the town. Ottomans approached Prievidza from the south and burned it in 1599, along with other towns in the upper Nitra river valley. In 1666, the Piarists built the baroque church (now known as the Piarist Church) and Monastery, which became a centre of culture and education. During the Kuruc uprising in 1673, Prievidza was burned down again, with fire burning a part of town's archives. In 1870, it had 2,719 inhabitants. Since the end of the 19th century and the beginning of the 20th century, industry started to grow, as the railways to Prievidza were constructed. During World War II, the city was one of the centres of partisans. On 4 April 1945, Prievidza was captured by troops of the Soviet 40th Army. Since the end of the war, the population has grown enormously from 5,000 inhabitants to around 53,000 inhabitants, as industry grew. Prievidza became the home of many miners and workers that found employment in the coal mines, the power station and the chemical factory in the nearby town of Nováky. Prievidza lies at an altitude of 280 metres (919 ft) above sea level and covers an area of 43.06 square kilometres (16.6 sq mi). The city is situated very near the smaller but more famous town of Bojnice, actually sharing the public transport system. The valley of the Nitra River, in which the city lies, is surrounded by mountain ranges on all sides, in the west Strážov Mountains, in the north Malá Fatra, in the east Žiar and in the south Vtáčnik. Prievidza is the eleventh largest city in Slovakia. 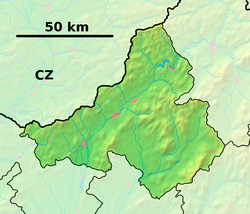 It is located around 60 kilometres (37 mi) south of Žilina, 69 kilometres (43 mi) km east of the regional capital Trenčín and 158 kilometres (98 mi) km from Bratislava (by road). Prievidza lies in the north temperate zone and has a continental climate with four distinct seasons. It is characterized by a significant variation between hot summers and cold, snowy winters. According to the 2001 census, the town had 53,097 inhabitants. 96.65% of inhabitants were Slovaks, 0.95% Czechs, 0.48% Hungarian and 0.29% Roma and Germans. The religious make-up was 61.91% Roman Catholics, 29.01% people with no religious affiliation and 2.29% Lutherans. In the city are placed 12 kindergartens, 8 primary schools or elementary schools and 8 middle schools or high schools consisting of two gymnasiums, one commercial/business academy and five secondary professional schools. Faculty of Management Science & Informatics University of Žilina has in Prievidza branch providing bachelor's degree study. Basketball is the most popular and successful sport in city. Prievidza won 2 titles in former men Czechoslovak Basketball League (1989, 1993) and after dissolution of Czechoslovakia 4 titles in men Slovak Basketball League (1994, 1995, 2012, 2016). Volleyball club VK Prievidza won 1 title (2018) in top Slovakia Men's Volleyball League. Football also has long tradition in city. Footballers such as Martin Škrtel, Juraj Kucka, Patrik Hrošovský or Dávid Hancko were raised in local football club . From Prievidza are also ice hockey players such as Andrej Sekera or Martin Štajnoch. ^ a b c "Municipal Statistics". Statistical Office of the Slovak republic. Archived from the original on 11 January 2008. Retrieved 22 January 2008. Wikimedia Commons has media related to Prievidza.